SHEfinds / Style / Laser Hair Removal – Would You Do It Yourself Or Leave It To The Pros? Do you box-dye your hair or even brave your own at-home-highlights? What about do-it-yourself mani/pedis? I sure do. It’s cheaper, most times faster, and you can do it in your pj’s while watching Gossip Girl. What about laser hair removal though? Would you trust yourself to use a handheld laser or other medical device to remove unwanted hair at home? In all honesty, the most cost effective device available is the No!No! that you can buy at several department stores and Sephora for around $250. It’s safe, reliable, and pretty darn cute. But what about the Silk’n pictured below? It’s not FDA-approved, but Silk’ns are now available for purchase through your dermatologist’s office – at $800 a pop. 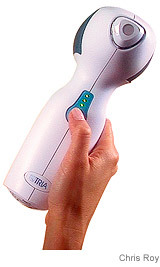 Another handheld device now available through your doc is called the Tria which retails at $995. It’s considerably cheaper than a $2,000 salon laser hair removal package – but these products are obviously lacking in ‘oomph’ if they’re being sold to Sally Sue off the street. Neither of these two have been FDA approved for the face nor for African American or darker skin tones due to the fact that lasers and light-based technologies work by targeting pigment in the hair and can mistake dark or tanned skin for the enemy. Yikes! If you have darker skin it is best to see a pro for laser hair removal. Though the best candidates for laser hair removal are light skinned folks with dark coarse hair (like me), the pros can safely and effectively treat clients with all skin tones. If you’re in NYC, there’s no better place to go than Beam Laser Spa. I went for my first treatment, a Brazillan, and the results were phenomenal. Andrea took her time and walked me through the entire process. I was ready for each blast – which felt almost like a rush of cold water against the skin – most of the time. I had zero irriation afterwards, and follow-up calls and emails from the ladies at Beam. Wow. I trust a pro using an FDA approved machine using the latest technology over a non-FDA approved handheld device any day. I’m partial to that area of my body – I’m not looking to burn it off anytime soon. For more ways to get rid of unwanted hair, check out our Guide to the Best Hair Removal Products.